VNPS programs are free and open to the public. Due to size limits, reservations are required for field trips. 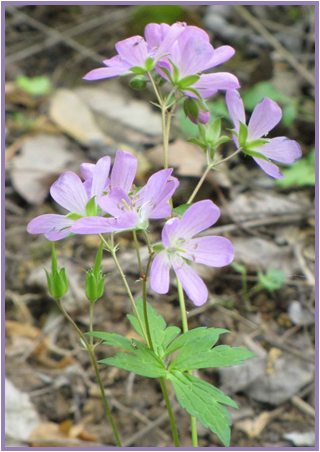 Join chapter Botany Chair Cris Fleming for a walk through one of our area’s best spring wildflower displays. Famous for the spectacular show of Virginia bluebells along the Potomac River, Turkey Run Park also harbors other early spring flowers such as dwarf ginseng, swamp buttercup, wild geranium, sessile trillium, perfoliate bellwort and many others. Participants need to be able to walk the zig-zag trail down the steep hillside and to cross the creek on rocks (there will be helping hands). Depending on bloom status, we may see the very early bloomers like harbinger of spring. The normal early bloomers may not yet be in full bloom. Large oaks, beech, tuliptree, basswood, sugar maple and other mature trees form an exceptionally fine hardwood forest at Turkey Run. A well-developed floodplain, rocky bluffs, and deep ravines are habitats of this 200 acre park. participants. Please RSVP to https://vnps20140412.eventbrite.com. Space is limited.